Ireland today is not a joyful spectacle. The older generation, which has worked hard and continues to work even in retirement, and whose hopes for a better life for their children did not materialize. Young people, who start their lives with disappointment in what is happening in their home country and who are again forced to leave their homeland and emigrate, as their ancestors used to do. The worst thing, in my opinion, is that still few people from all these ordinary people understand that it is impossible to LIKE SO. It is impossible for the whole country to live in debt for decades, paying high interest from banks on mortgages for a house, car, education, vacation. Millions of people throughout the state voluntarily give their earned money to the owners of just three banks on the Emerald Isle and create for them and their children a truly luxurious life now and more than a secure old age in the future. Unfortunately, I do not draw pictures of horror. This is the life of almost every Irish family. Female domestic drunkenness is one of the reasons why so many children with various mental disorders of children are born in Ireland. So economists ’arguments with numbers in their hands and endless debates of deputies in the Parliament - whether to borrow in a European bank or not and how to get the country out of a deep crisis - remind me of a situation when they try to treat a neglected disease this very disease. 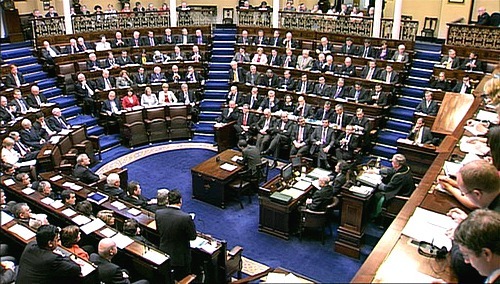 Ireland became a republic in 1922 and a significant number of parliamentary seats for a decade were occupied by members of the Irish Conservative Party, the Fianna Fial party. To understand what is happening today, we must not forget that this party was made up of wealthy and very rich people, and according to the notions of capitalist society that were natural for themselves, pursued a corresponding political course for the development of the economy in the country. The conservatives have been with the actual authorities for more than 80 years. In the parliamentary elections of 2007, I covered the election campaign in the newspaper, interviewed deputies of different parties in Parliament, and I remember very well who ordinary Irish people voted for - the average Irishman gave more votes to the conservative party Fianna Fail, whose members, being in all leadership , high positions and positions, created for themselves, their families, relatives such conditions under which everyone could "do" - no, not earn hard work - a huge amount of money, and that it was their actions just through several Only years led this country to a banking crisis. 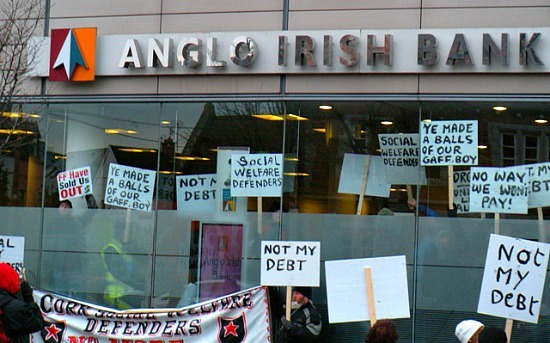 Just one example to illustrate - two of the owners of Anglo-Irish - the Anglo - Irish Bank - lent each other huge sums of bank money, but the simple Irish paid interest on them. Another interesting face from the same company. He was prosecuted. Looking into the camera with clear eyes after the court session, the banker told the journalist, “Why should I tell the judge where I keep my money?” Read - my stolen millions. And this is one of the richest Irish family clans. Do you want to know how much was given to him? Three months. And since the trial began before Christmas, the lord was released to the family so that, like all good Catholics, he could spend Christmas in a warm family circle. But I remember well another meeting. Two days before Christmas, I walked through the center in the evening, I was met by a group of young people. The guys asked me for a light, but I do not smoke and there were no lighters with me. We got to talking and the guys told that they are builders, just returned from England, where they could not find work either. When I asked where they were going to look at night, they replied that they were walking through the streets during the day, trying to find any job, knocking on the doors of restaurants from the back door and offering to wash the dishes for dinner, and go to an overnight house for the night. I gave the young Irish some money so that they would celebrate Christmas, which they had been robbed of in their native country and I am afraid they did not understand that they were simply robbed. How millions of other decent and hardworking Irish people, the main honest taxpayers of the country, who have no education in closed, private schools, without connections in high society, who grew up in a country with a tragic historical past, which for centuries has been trampled upon by English heels and therefore they want to live so beautifully. Unfortunately, I can not say that money for an ordinary Irishman is all that he seeks, for which he lives and works. There is such a thing as the human factor. From my personal position as a journalist and person, in everything that happened in Ireland, the Celtic tiger has nothing to do with it. He jumped, but he landed very badly, and if the economy of this country recovers from such a deep crisis, then, as the entire current situation in the political course of Ireland shows, it is very soon. You are welcome to do your conclusions now.